Among the numerous 'dated' inscriptions of Rajaraja Chola - 1 available to us today, when sequenced according to the year of the inscription in a decending order the latest dated inscription is found to be that of his 29th year. Hence his year of accession being A.D.985 the year of his demise can be safely concluded to be as the year (985 + 29) = A.D.1014. This is furthered ascertained from the two Inscriptions on the Thanjavur Rajarajeswarem temple which records the donations made by Kundavi Piraatiyaar the elder sister of Rajaraja Chola - 1 up to the 29th year of Rajaraja Chola -1 (985+29) A.D.1014 and up to the 3rd year of Rajendra Chola - 1 (1011+3) = A.D.1014. This clearly indicates that when Rajendra Chola - 1 became the Emperor he made sure the details of what was gifted to the temple up to the year A.D.1014 by Kundavi Piraatiyaar were properly recorded - possibly it being the year he ascended the throne, with the demise of Rajaraja Chola - 1. The view held hitherto by earlier Scholars in History on the so-called Rajaraja Chola-Karuvur Thevar Mural at Thanjavur Rajarajaeswarem temple, has now taken a new turn with the theory put forward by Thiru Vijay Kumar a renowned Scholar in the study of Chola period Bronze Icons and Stone Sculptures of temples of Tamil Nadu in his Website namely the 'Poetry in Stone'. He has very correctly pointed out that the appearence of so-called Rajaraja Chola - 1 in this Mural doesnot match with the actual age of Rajaraja Chola - 1 at the time of painting this Mural being around A.D.1011/1014. This inference is supported by the fact that Rajaraja Chola - 1 was 65 years old and his son Rajendra Chola - 1 was only 46 years old around the time A.D.1014. In this connection see my approximate computation of their ages in my discussion appearing in Part - 3 of this Thread. Further the so-called Rajaraja Chola-Karuvur Thevar Mural is the largest portrait painting in this corridor being around 6 ft in height. Hence the two images depicted in this Mural must be that of 'two great personalities' than others in the remaining Murals in the corridor. Also as pinpointed by Thiru Vijay Kumar in the so-called Karuvur Thevar portrait we see him wearing a smaller crown (in gold colour as seen in the above picture - worn only for normal occasions), while the so-called Rajaraja portrait is without same. Hence it is clear the personality erronously stated to be that of Karuvur Thevar has to be of a great royal personality than the Tamil Saiva Saint Karuvur Thevar, and was of much more importance than the personality the so-called Rajaraja Chola - 1 in this Fresco. Further it is noted from the portrait that both of them are wearing what appears to be a thick solid Thaali (necklace) of similer design, with so-called Karuvur Thevar having one on him and the so-called Rajaraja two on him. It is not a normal practice for a Saint and a Royal personality to wear jewellery of the same design and further a Saint to wear a golden crown unless they both are royal personalities. Hence this Mural should be that of Rajaraja Chola - 1 and his son the Rajendra Chola - 1. The actual Rajendra Chola - 1 identified in this portrait panel is not wearing a crown possibly since he was still a heir-apparent (yuvaraja) and not an emperor at the time the painting was executed, and seen in this Mural standing behind the father with due respect. Karuvur Thevar was only a Tamil Saiva Saint of the period Rajaraja Chola - 1 and Rajendra Chola - 1, and have sung Tamil Thevaarap Pathikams (Thiruvisaippaa - 9th Thirumurai) on the two temples built by the above two Emperors named Rajarajeswarem temple and Gangaikonda Cholaeswarem temple, but was not in the close move with these two Emperors, and there are no single inscriptions of these Emperors which refers to Saint Karuvur Thevar. However there are other inscriptions which indicates the close association of the two other Gurus with these two Emperors namely the Esaana Siva Pandither and Sarvasiva Pandithar. Hence the earlier view of some Scholars stating one of the image in the Mural under reference is that of Karuvur Thevar have to be dismissed. Hence from the foregoing it is very clear the image of so-called Saint Karuvur Thevar hitherto held by Scholars has to be in reality that of Rajaraja Chola - 1, and the image of so-called Rajaraja hitherto held by these same Scholars has to be that of Rajendra Chola - 1 as gleaned from the foregoing and the portrait. The kamandalam (vessel) held in one hand by actual Rajaraja Chola - 1 in the lengthy portrait of same, indicates that he lead a more spiritual and religious life during his last stages of his life. From the above Inscription it is very clear the 9th of Rajendra Chola - 1 was Saka year 943 which is (943 + 78 = A.D.1021). Hence the Year of appointment of Rajendra Chola - 1 as the heir to the Chola throne was 1021-9 = A.D.1012. The Indian Scholars of History has already determined that Saka full completed Years + 78 = A.D. full completed Years. This is furthered ascertained from the two Inscriptions on the Thanjavur Rajarajeswarem temple, which records the donations made by Kundavi Piraatiyaar the elder sister of Rajaraja Chola - 1 up to the 29th year of Rajaraja Chola -1 (985+29) A.D.1014 and up to the 3rd year of Rajendra Chola - 1 (1012+3) = A.D.1016. This clearly indicates that when Rajendra Chola - 1 became the Emperor he made sure the details of what was gifted to the temple up to the year A.D.1014 by Kundavi Piraatiyaar were properly recorded - possibly it being the year he ascended the throne, with the demise of Rajaraja Chola - 1. Emperor Rajaraja Chola - 1 learnt from the Chinese and South-East Asian traders at Nagapattinam the Chola Seaport on the greatness of the Northern Sung Empire of China, and the ruling Chinese Emperor Cheng Tsung of that period. He with a view of strengthening the existing trade relations with new political relations with China and the relations with the other countries in Sourh-East Asia, decided to send a special delegation to pay homage to the Chinese Emperor and visit the other countries. In the year A.D.1012 Rajaraja Chola - 1 sent for the first time a delegation of fifty two envoys with four great officers headed by his Vice Minister Chola Samudran (Choli-San-ouen), his deputy Pou-kia-sin a Judge Weng Wu and guards lead by Ya-kin-kia travelled from Thanjavur (the Chola interior capital city) to Nagapattinam (Na Wu Tan Shan) seaport city on the west coast (of present India) and embarked to China. They touched in at Sri Lanka (Choli Seylan = northern half of Sri Lanka under the rule of Cholas), and after seventy seven days reached the kingdom of Rammanadesa (Tchen-Pin Kuo) of present lower Miyanmar. From here they travelled for sixty one days and reached the kingdom of Kadarem (Ku Lo Kuo = Kedah country) of the present north Malaysia adjacent to sea having a mountain named Gunung Jerai (Kedah Peak = Valvathi Parvatham in Sanskrit) with the river Sunghai Bujang flowing from it in to the sea. The only other island they stopped on the way was Yi Mo Lo Li. They set sail from Kadarem for seventy one days, on the way called at Chia Pa Island, Chan Pu Lao Island, and Chou Pao Lung Island, and reached the kingdom of Sri Vijaya (San Fo Chi Kuo - Palembang country) of the Sri Vijaya Empire on the lower east Sumatra of present Indonesia, ruled by the Buddhist Emperor Mara Vijayotungavarman (A.D.1008-1020). The delegation again set sail for anothr eighteen days and crossed Man Shan Island, touched at Tien Chu Island and arrived at the Pin Tou Lang Island. The last leg of their sail from here took another twenty days callng at Lan Shan Island and Chiu Hsing Shan Island and finally at the Pi Pa Island at the Kouang-Tcheu port (the 'Canton port' now known as Guangzhou port) in the south of China (opposite present Taiwan island). The Chola delegation reached the port of Kouang-Tcheou port of China in the year A.D.1015 (in the 8th 'reign year 'ta-tchong-siang-fou' of Emperor Cheng Sung) after 1150 days from the time they left the Chola Country (in the year A.D.1012), and of this total time taken 247 days was entirely for the sea travel. Hence it is very clear the balance 903 days being around two and half years were spent at the kingdoms of Rammanadesa, Kadarem and Sri Vijaya. Probably the objective of the Emperor Rajaraja Chola - 1 in sending a big delegation to South-East Asia in addition to their intended official homage to the Emperor Cheng Sung of China, was to build new political and trade relations with the kingdoms of Rammanadesa, Kadarem and Sri Vijaya empire, headed by one of his four high ranking officers of his empire the Choli Samudran. "......king Locha Locha (Rajaraja) of Chu Nien (Chola country) sent his envoy Soli Samudra (Chola Samundan) and Embassy to China to pay tribute consisting of a Robe and a Head Wear woven of pearls, ivory, and spices, and medicinal herbs.....It took the Envoy one thousand one hundred fifty days to reach Canton. The emperor treated him as he did the envoy of Kutcha. When lift for his own country the emperor issued an edict to king Locha-Locha and bestowed upon him many things. But Choli Samudra died when he reached Hsiang Yi country where he was buried. The emperor felt sorry to hear it and sent an official to Hsiang Yi to hold a libation rite"
Though the contemporary period Chinese historical annals mentions of the arrival of the Chola delegation at Rammanadesa, Kadarem and Sri Vijaya it doesnot mention any details of their stay at this cities. However we could be very definite that this Chola delegation met the kings of Rammanadesa, Kadarem and Sri Vijaya Emperor Mara Vijayotungavarman at their capital cities and would have paid homage and strengthened further their existing political and trade relations. This is confirmed by the very fact that Mara Vijayountunavarman's father the Emperor Chulaamanivarman (A.D.998-1008) of Sri Vijaya was granted by Emperor Rajarja Chola - 1 in A.D.1006 the Aanimangalam village at the Nagapattinam Seaport city in the Chola Country, to build a Buddhist temple named as Chulaamanipanma Vihare with the lands being exempted from taxes. While this Vihare was being constructed Emperor Chulaamanivarman demised in the year A.D.1008 and the construction of the Vihare was completed by his son Mara Vijayotunavarman. This good Chola-Sri Vijaya relationship existed up to A.D.1023. We also note during this perod there had been active trade between Rammanadesa (also known as Arumanam in Tamil) and Kadaaram, and the teak wood which was imported to Chola contry fromn Rammanadesa was known as 'Arumanavan' and the iron from Kadaaram was known as the 'Kadaaraththu Irumbu'. Hence it is very clear the Chinese source wouldnot have taken interest to detail the delegation's visit to Rammanadesa, Kadarem and Sri Vijaya, as the objective of the Chinese source material was only to detail the Chola-Chinese relationships. There had been few other Hindu Temples in Kwang Chou (Canton = present Quanchow) and the broken sculptures are now kept on display at Quanchow Museum. One such portion of sculpture depicts the Silanthi (spider), Yaanai (elephant) and Sivalingam related to Chola Kochenganaan (one of the 63 Tamil Saiva Saints of Tamil nadu) story found in Tamil Sunderamoorthy Naayanar's "Thiruthondar Thokai" and Seikkilar's Periyapuraanam). This confirms the presense of Tamil Traders at Kuwang Chow during that period. Towards the year A.D.1014 Emperor Rajaraja - 1 fell ill, and spent his last days of his life at his palace known as "Sivapaathasekaran Maalikai" in the village 'Sivapaathasekara Mangalam' at Udaiyaarkudi (Udaiyaalur) in Palaiyarai (the heraditary capital of Cholas) in Tamil Nadu where he met his death. Rajaraja Chola's Maalikai was the Palace where Rajaraja Chola - 1 spent the last days of his life . After Rajaraja's demise the Pidaarer of the 'Sivapathasekara Mangalam' have consecrated an idol of Rajaraja Chola - 1 (elentharuli nintra) at his Palace 'Sivapaathasekaran Thevar Maalikai', and conducted Poosai Valipaadukal and reciting "Tamil Thirumuraikal" to his soul's merit and for his manifestation as a divinity in the idol, virtually making it a Memorial temple and was under the supervision of these Pidaarer of the 'Sivapathasekara Mangalam'. இவருடன் விரதங்கொண்டு செய்தார் இவ்வூர் பிடாரகளில் ராஜேந்த்ரசோழனுதைய நாயகநான ஈசானசிவரும் தேவநபயமாந அறங்காட்டி பிச்சரும்......"
In the above reading of the Inscription we will try to understand what is meant by the words underlined. What does realy "eluntharuli nintra Sri Rajaraja Thevar" mean ??. Under normal understanding we could possibly take it to mean that "Rajaraja was bodily present at the….thirumaalikai". A similer usage of the word "eluntharuli" could be seen in an Inscription in the Thiruvarur Temple, where the bodily presence of Rajendra Chola - 1 and Anukkiyaar Paravai Nangai on a chariot is referred to as follows, in the same sense. "......Sri Rajendra Chola Thevarum Anukkiyaar Paravai Nangaiyaarum Ther mel eluntharuli......". Hence it is clear "eluntharuli" means being bodily presence at a place. The Paalkulaththu Amman Temple - Pillar Inscription belongs to the period of Kulothunga Chola - 1(A.D.1070-1120). Since it mentions "eluntharuli nintra Sri Rajaraja Thevar" it is impossible for Rajaraja Chola - 1 to be bodily present nearly 98 - years later during the period of Kulothunga Chola - 1 at "Sivapaathasekara Thevar Thirumaalikai". Hence it is clear it was an Idol of "Sri Rajaraja Thevar" that would have been consecrated within the Palace known as "Sri Sivapaathasekara Thevar Thirumaalikai" at Sri Sivapaathasekara Mangalam. The normal Palace of Rajaraja known as Maalikai has been pre-fixed with the word "Thiru" possibly because this Palace has been turned into Memorial Palace. Daily Poosai valipaadukal "would have taken place" to this Idol of Rajaraja Chola - 1 and "possibly" it was considered that Sri Rajarajadever alias Sivapathasekaran will manifest himself (eluntharuli as the divinity) in this Idol and bless his worshippers. The "Tamil and English Dictionary' of Miron Winslow gives the meaning to "eluntharula" as – "to become present or manifest as the divinity in an Idol on consecration" which confirms the above inferance. Further from the continuation of the above Inscription (refer www.varalaaru.com) it follows that the dilaptated big "Thiru Mantapam" (sacred hall) in front of the Sivapathasekaran Maalikai was rebuilt on behalf of the Velaan Arikesavanatha Kasirajan of the village Pidavur (problably funded by him), executed through the head of the village "Sivapaathasekara Mangalam" namely Jayasingha Kulakaala valanaattu, Kulamangala naattu, Saaththa Mangalaththu (Saaththa Mangalam - his native village) - 'Saaththamangalamudaiyaan nam Pidaaren Naadaripukalan', along with two other Pidaarer of this village (Sivapaathasekara Mangalam) named Rajendra Chola Uthaiya Nayakanaana Esaana Sivar and Thevan Abayamaana Arangkaatti Pitchchar. From the above we note it was three Pidaarer who executed the rebuilding of the dilapitated big Mantapam in front of the Sivapaathaseara Thirumaalikai at Sivapaathasekara Mangalam. From Rajarajaeswarem temple Inscriptions we are aware the Pidaarer were the Tamil Saiva Temple Priests who conducted the temple Poosai Valipaadukal, and recited the Tamil Thirumuraikal at the time of worship. There were collective settlements of the Pidaarer - the Tamil Saiva Priests and were known as Mangalams, where as the collective settlements of the Sanskrit Vedic Priests were known as Chathurvedi Mangalams. Hence it is gleaned from the Inscription under reference, that the head of the Saivite Priests village known as 'Sivapaathsekara Mangalam' was a Pidaaren, who was earlier a native of another Saivite Priests village known as the 'Saaththa Mangalam'. Further 'Maalikai' means a (king's) palace. We see many Maalikais being mentioned in the Chola Inscriptions, seated from where they made proclamations and orders which were executed by his Officers. Hence we note the Rajaraja Chola's Maalikai was possibly was his Palace where he spent the last days of his life situated at the village 'Sivapaathasekara Mangalam'. That could been the reason this village has been called after one of his name as 'Sivapaathsekara Mangalam' and the Palace as Sivapaathasekaran Maalikai. It appears after his death the Pidaarer of the 'Sivapathasekara Mangalam' would have consecrated an idol of Rajaraja Chola - 1 (elentharuli nintra) at his Palace 'Sivapaathasekaran Maalikai', and conducted Poosai Valipaadukal and reciting Tamil Thirumuraikal to his soul's merit and for his manifestation as a divinity in the idol, virtually making it a Memorial temple and was under the supervision of these Pidaarer of the 'Sivapathasekara Mangalam'. A "Pallippadai" Temple is a monumental temple of a king or queen built over the vault having their ashes after their death, with a basement over same and a Sivalingham consecrated over it, and were "also" called as "Eswarems". As the Inscription under reference doesnot mention the words "Pallipadai" or "Eswarem" but only as the "Sivapathasekara Thevar Thirumaalikai" it could have been possible that his Palace was made sacred (Thirumaalikai), where Emperor Rajaraja Chola's Idol was consecrated and worshiped at Udaiyalur in Palaiyaari (the heraditary capital of Cholas). It could be possible that the Pillar now seen with the Inscription at Paalkulaththu Amman Temple Doorway, could have been the Pillars of this Memorial Palace where Rajaraja Chola's Idol was worshiped, and the Sivalingam which is seen presently partly buried at Udaiyalur could have been possibly the Sivalingam in another Siva Temple closer to this Memorial Palace. With further strengthning of the Chola relationship with the Sri Vijaya kingdom of Sumatra in Indonesia, king Mara Vijayothungvarman of Sri Vijaya built another Buddhist temple at the village Aanaimangalam at Nagapattinam adjacent to the already existing Rajaraja perumpalli (alias Sailendra Chudamanivarma viharam), built by his father Chudamanivarman of Sailendra dynasty. This temple was named in honour of the ruling Chola king Rajendra Chola - 1 as "Rajendrachola perumpalli"
".....the Rajendra Chola perumpalli, and the Rajaraja perumpalli constructed by the Kidaraththaraiyan (king of Kadaram) at Keyamaanikkavalanaattu pattana kootraththu Cholakulavalli pattinam......"
Inscription on stone slab, Kolapaakkam Agatheesvarer temple, Sri Perumputhuur, Kaanchipuram Maavattam, Tamil Nadu. Kolappaakkam New Kalvettukal by Dr.S.Rajavel, page 125, Avanam Journal Ithal 17, 2006. With the death of Rajaraja Cholan - 1 in the year A.D.1014, and with the accension of Rajendra Cholan - 1 in the same year as the next emperor of the Chola empire, there was a lapse of two years in the latter continuing with his war expeditions. Rajendra Cholan - 1 commenced his war expeditions in the Indian Mainland when he was yet a co-regent of his father, with the capture of Iddaithurai Naadu the central Karnataka, bordering Andhra Pradesh, Vanavaasi of west Karnataka, in one expedition in the year A.D.1012. He therafter directed his attention on Kollipaakkai of north Andhra Pradesh, and captured same in the year A.D.1013. The above two expeditions were carried our by Rajendra Chola - 1 on behalf of his father Rajaraja Chola - 1. In the year A.D.1014 he lead an expedition against the Irrataipaadi Elaraillakam the north Karnataka & south Maharashtra, and captured its capital city the Mannaikadakkam the Maleked, also on behalf of his father, which met the reverse after its intial capture by Rajaraja Cholan in the year A.D.1006. With the death of Rajaraja Cholan - 1 in the year A.D.1014, and with the accesion of Rajendra Cholan - 1 in the same year as the next emperor of the Chola empire, there was a lapse of two years in the latter continuing with his war expeditions. The good relations of the Chola empire with Sri Vijaya continued during the rule of Rajendra Chola - 1. In the year A.D.1014 a Trader named Pahavan Pathinaaman a native of Mentrontri Pattinam of Keetsembinadu in Rajaraja Mandalam, an Agent of the Emperor Maara Vijayotungavarman of Sri Vijaya gifted endowments and 30 kasu to the Thirikaaronam Udaiyaar Siva temple at Nagapattinam in Pattinakkuutram of Shythiriya Sihamani valanadu. This endowments was recorded by Pattaarahan Theendan and Kooththan Muuvayiravan. In the year A.D.1015 this same Agent of the Emperor Maara Vijayoungavarman of Sri Vijaya gifted jewellery namely a Veerapattam made of 14.5 kalanju gold studded with 14 kalanju precious stones the ruby and emerald, to the deity Naagaiyalahar portrayed in silver image at the Thirukaaronam Udaiyar temple of Nagapattinam. This gift was recorded on the instructions of the temple administrator of that period the Kandiyuurudaiyaan Senthan of Arumolikuuttram. "......Hail prosperity. In the secondth year of Koparakesaripanma alias Sri Rajendra Choladeva the trader Pahavan Pathinaman of Mentontri pattinam of Kitsembinadu in (Rajaraja mandalam) agent of the king of Sri Vijaya (gifted endowments) to the Lord Thirukkaronam Udaiyaar in Nagapattinam in Pattinakkuttram in Shythiriya Shihamani valanadu......"
Inscription of Rajendra Chola - 1 at Karonaswami temple, Nagapattinam, Tamil Nadu, India. "........Hail prosperity. In the 3rd year of Sri Ko Parakesaripanmar alias Sri Rajendra Choladeva, the agent of the king of Sri Vijaya of Mentrontri pattinam of Kitsembinadu in Rajarajamandalam gifted to the (lord) Nagaiyalagar in silver image at (Thiru)karonam in Shythiriya Shihamani valanadu gifted gold jewels set with ....ruby and emerald......"
Rajaraja Chola's chief queen (pattamahishi) Panchavan Maatheviyaar with no off-spring by Rajaraja Chola - 1 showed much love and affection to Rajendra Chola - 1 the son of Rajaraja by his second queen Thiribhuvanamaathevi alias Vaanavan Maatheviyaar. This relationship paved way for Rajendra Chola's special regard and devotion towards Panchavan Maatheviyaar his "Periya Annai", and on her death in the year A.D.1018 he built a "Pallippadai temple" named 'Panchavan Maathevieswarem' at Palaiyaarai alias Mudikonda Cholapuram in the present Thanjavur district in Tamil Nadu. ".....Land for worship and offerings to God in the Panchavan Maathevieswaram built as Pallippadai at Palaiyaru alias Mudikonda Cholapuram in Thirunaraiyur Nadu, a sub-division of Ksatriya Sikamanai Valanadu........Lakulisvara Panditha who supervised the affairs of the temple......"
In the year A.D.1019 an Agent of the viceroy King of Kadarem named Sri Kuruththann Kesavan alias Agralekai presened 87.5 kalanju of Chinese gold and 60.75 local gold for jewels to the deity of Thirukaronam Udaiyar temple at Nagapattinam, for worship and food offerings to God Arthanarihal (Arththanaatheeswarer) in stone Image consecrated by him, and for feeding of two Brahmin Priests of this temple. "......Ko Parakesaripamarana Rajendra Chola thevarkku aandu (e)laavathu Kshythiriya valanaattu Pattinakkuutraththu Nagapattinaththu Thiruk Karona(u)daiya Mahaathevar koyilil Kidaraththaraiyar Kanmi Sri Kuruttan Kesuvanaana Agralekai elunththaruluviththa Arththanaarikalukku avipali archanaikku enru metpadiyaan varakkaattina Cinakkanakam enpaththelu kalanju mukkalum metpadiyaan ith Thevar koyilil utthahmakram irantukalam unna pokatthukku entru varakkaattina Cinakkanakam enpattelu kalanju mukkaalum metpatiyaan Thevakkum, Bramanarkkum....tayiru.....entru varakkaattina untikaippon (a)rupatin kalanju mukkaalum aaka ippon irunurru muppattaru kanlanju kalum Thiruk Karonamudaiyaarkku vendum tiruvaaparanam ullittana ceyakk kondu ith Thevar pantarattai...."
Annual Report on Indian Epigraphy - 1956/57, Inscription No 166, page 15. During this period on a further request of the Emperor Mara Vijayotungavarman of Sri Vijaya who was also the overlord of Kadaarem, another Buddhist temple was built at Nagapattinam in the close vicinity of the earlier Buddhist temple - the Sri Sailendra Chudamanipama Vihaaram, which was named after Rajendra Chola - 1 in honour of him, as "Rajendra Chola Perumpalli". This temple had among others two bronze images of lord Buddha one in the standing pose with the Tamil inscription on the lower rim of the pedestal as Cholaperumpalli Naayakar, and the other in the seated pose with a Tamil inscription bearing the name Cholaperumpalli Aalvar. This Buddhist temple had another big subshrine for lord Buddha in named as Akkasalai Perumpalli built within the same complex by the traders of Tamil Nadu of the trading guild "Thisai Ayiraththu Iym Nootruvar of Pathinen Poomi (trading in eighteen lands)" for their worship and welfare. To this sub-shrine a local chief by the name Naalaang Kunaakara Udaiyaar consecrated a bronze image of Buddha image by the name "Akkasaalai Perumpalli Aalvaar" to be taken around in procession during the days of the utsavam ceremony at this temple. "......Kidaaratharaiyan Keyamaanikka valanaattu pattanak kuutraththu Cholakulavalli pattinaththu eduppiththa Rajendra Chola Perumpallikkum, Rajaraja Perumpallikkum pallisanthamaana uurkal......"
"......'Chola Perumpalli Naayakar' - 'The Nayakar (Lord Buddha) of (or dedicated to) the Chola Perumpalli'. Obviously this votive image was meant for the Chola Perumpalli which was a celebrated Buddhist Vihare erected in Nagapattinam by the Sailendra ruler of Sri Vijaya (in Sumatra) and named after the reigning Chola king Kulothunga - 1. ".......Rajendra Chola Perumpalli Akkasaalaip Perumpalli Alvaar koyilukku thiru utsavam eluntarula Alvaar ivvalvarai eluntaruluvittaar Chirutaavur Nalankunaakara Udaiyaar, Swasti Sri Pathinen Vishayattukkum Akkasaalaikal Naayakar....."
International character of Nagapattinam Merchants during the Chola period. In the first reference above, my view is that the 'Chola Perumpalli Nayakar' was not named after Kulothunga Chola - 1, but after Rajendra Chola - 1 in view of the fact the Smaller Leidan Plates which was issued by Kulothunga Chola - 1 and which mentions about Rajendra Chola Perumpalli doesnot give any hint that it was built by him. Further it doesnot refer to it as 'Kulothunga Chola Perumpalli' but only as "Rajendra Chola Perumpalli". In this instance we should remember that Kulothunga Chola had the name as Rajendra Chola only when he was a heir-apparent of Chola country and the ruler of Chalukya Vengi country. The Emperor Maara Vijayothungavarman of Sri Vijaya empire demised in A.D.1015 and was succeeded by his son Sangirama Vijayothungavrman (A.D.1015-1024). The good trade and diplomatic relations between the Chola empire and the Sri Vijaya empire existed upto the end of Maara Vijayothungavarman's rule. In the year A.D.1021 Emperor Sangirama Vijayotungavarman of Sri Vijaya in Sumatra gave her daughter Sangirama Vijaya Dharma-Prasadotungadevi in marriage to king Airlanga of East Java. From the year of their marriage in A.D.1021 onwards, she was made the "Mahamanthiri" (the chief minister) of the kingdom of East Java by king Airlangga, and was second only to the king Airlangga in controlling power and authority in the kingdom. Oud-Javaansche Ookonden - Nagelaten Transscripties, van wijlen Dr. J.L,Brandes, Uitgegeven door Dr. N.J.Krom - page 120. "........Swasti Saka warsatita 959 (959 + 78 = A.D.1037) marggasiramasa......Sri Maharaja rake halu Sri Lokeswara Dharmawangsa Airlanggananta Vikramotunggadeva inadah rakryan mahamantri i hino Sri Sangiraama Vijaya Dharmaprasadotunggadevi......"
Oud-Javaansche Ookonden - Nagelaten Transscripties, van wijlen Dr. J.L.Brandes, Uitgegeven door Dr. N.J.Krom - page 120. Many Indonesian Scholars opt to go for te Reading version - 2 of the Pucangan Inscription (also known as Calcutta Stone Inscription) as it has been a re-study of this inscription by Dr J.L.Brandes & Dr N.J Krom, and from same we note Airlangga became a king of East Java in the year A.D.1019. It is very clear in the year A.D.1021 if we go by Reading version - 1 of Pukangan Inscription at an age of 31 years Airlangga wouldnot had a daughter old enough to occupy the post of Rakryaan ma ha mantri i Hino (that is as a person who had the controlling power in the kingdom only next to the King), and if we go by Reading version - 2 at an age of 21 years to Airlangga this theory totally fails. So it is very clear that Sri Sangiraama Vijaya Dharmaprasadotunggadevi was not the daughter of Airlangga as held by some Scholars, but his Queen who was given the supreme powers by the king only next to him. Rajendra Chola now turned his attention on his expeditions near overseas and being ambitious of subduing whole of Sri Lanka, in the year A.D. 1016 sent a war expedition led by the commander -in-chief and commissioner Jeyamkondan alias Muventha Velar which crossed over and conquered the southern half of Sri Lanka and brought the whole island under the Chola yoke. The king Mahinda-5 ruling the southern half of Sri Lanka was captured with his queen, daughter and articles of regalia, and taken prisoners to Chola kingdom by this Commander. The Chola Forces also recovered the items of Regalia and crown of the king Rajasimhan (A.D.900-920) of the Pandiya country in Tamilnadu which were earlier left by him with the Sri Lankan king Dappula-4 (A.D.923-934), after his defeat by the Cholas in A.D.1017. These items too were transported to the Chola country. தெண்திரை ஈழ மண்டலம் முழுவதும் (whole of Elamandalam)......."
Rajendra Chola appointed one of his sons as the viceroy in Sri Lanka with the title Ilangaiyarkku Iraivan who was also known as Chola Ilangeswaren alias Sri Sangapanmar. The region in Polonnaruwa where he resided and ruled was known as Chola Samasthanam. (Solasamasthanaya of Polonnnaruwa). Rajendra during his rule of whole of Sri Lanka, issued gold coinage with the legend "Yuddha Malla" inscribed on them referring to him as a great warrior. 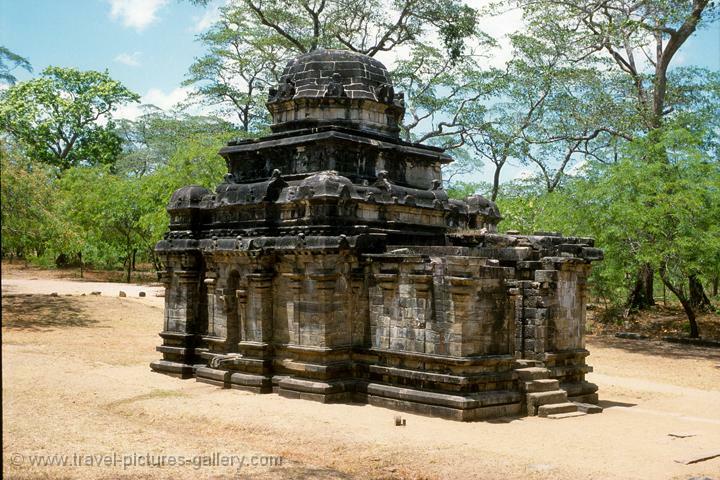 Rajendra Chola - 1 built a Siva Temple at Jananathapuram the present Polonnaruwa in north central Sri Lanka named after his mother Vaanavanmathevi (Queen of Rajaraja Chola - 1) and named it as Vaanavanmathevi eswarem. ".....Raja Rajenthira valanaattu.....Jananaatha Man(ga)laththu Udaiyaar Vaanavanmaathevi eswaremudaiya(rkku) thirunonthaa villakku....."
"......-na Vaa(navan maa)thevi eswaremudaiyaar koyilt palli kondaaraiyum......"
Ilankai Thamil Saasanangal - Prof C.Pathmanathan, Inscriptions 1 & 3, page 399, 401. "......Niharilichola valanaattu Pulainariyaana Jananaathapuraththu irukkum ith Thevar......"
Ilankai Thamil Saasanangal - Prof C.Pathmanathan, page 41. This was followed by an expedition of Rajendra Cholan to east Kerala in the year A.D.1017 which captured the Kudamalai Nadu. Rajendra Chola - 1 after re-establishing Chola authority over Kerala he appointed his eldest son Rajaraja (as per Indalur Cheppedukal) as as the viceroy with the title "Chola Keralan" and made him rule this region. Further after Rajendra Chola - 1 after re-establishing Chola authority over Paandiya country he appointed his second son Rajathiraja as the viceroy with the title "Chola Paandiyan" with a new palace built for him and made him rule this region. Inscription at the Thiruaandaar temple at Pondicherry, Tamil Nadu. Also Rajendra Chola - 1 after re-establishing Chola authority over Gangapaadi appointed his another son ???? as the viceroy "Chola Gangan" and made him rule this region. Rajendra Cholan's forces crossed seas again, in the year A.D.1018, and captured the Pal Palanthivam the many islands of Maldives & Lakshadweep. This was followed by the capture of Sandimaaththivu the Kavaratti island overseas west of Kerala, in the same year A.D.1018. In the year A.D.1019 an Agent of the Emperor Maara Vijayotungavarman of Sri Vijaya named Nimalam Ahatheeswaren (Keethibhavan) gifted to this temple of Thirukkaronamudaiya Mahadevar temple with a "gateway" to the Thiruchchuttru Maalikai of this temple and he temple Administrator Puththamangalammudaiyaan Naahan Kumaran of Ala Nadu instructed the donation be recorded. This Agent further arranged the donation of two Matta Vilaakuhal, two Paavai Villakuhal, a Kurakku Villaku and five other type Vilakkuhal (lamps) to this temple. In the year A.D.1019 Rajendra Cholans sent another expedition against the Irrataipaadi Elaraiillakam the north Karnataka & south Maharashtra - now with its new capital at Kalyani, in the northmost Karnataka which the Cholas lost again but re-captured after a battle at Musangi of east Karnataka. Rajendra Cholan - 1 with his capture of many regions in the Indian mainland after a lapse of two years he became more ambitious in conquering the northern and north-western regions of India.